Colin Haag III, 20, of Bristol Township, is charged with criminal homicide in the death of his cousin. 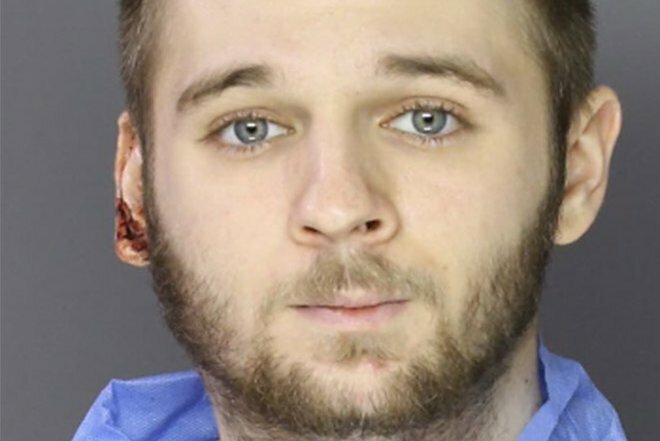 A Bristol Township man has been formally charged with homicide one week after his 14-year-old cousin was found stabbed and shot to death inside their Croydon home, Bucks County prosecutors announced on Friday. Colin Haag III, 20, had been considered a prime suspect in the young girl's death following his arrest on gun charges earlier this week. The teen, identified as Autumn Bartle, was found unconscious and bleeding on the living room floor when her mother returned home from work on Good Friday. An autopsy completed on Tuesday determined that Bartle died from a gunshot wound to the head and had been stabbed more than 80 times. Prosecutors said Haag lived in the basement of the home and was nowhere to be found when the girl was discovered by her mother. Bartle died Monday morning at St. Christopher's Hospital in Philadelphia. Authorities said Haag was later found along State Road in Bensalem. He attempted to flee from police before allegedly shooting himself in the throat. He survived and fled behind a nearby building until additional officers arrived and subdued him. Investigators said Haag was in possession of a gun owned by the girl's father, Michael Bartle. A second gun was missing from the home. Inside Haag's backpack, police allegedly found a spiral notebook with blood matching Bartle's DNA. On the last page, a blood-marked notation read, "this is the last of slim that's all you get it's the end 4 me," according to prosecutors. Analysts in Montgomery County determined the bullet removed from the girl's head was fired by a semiautomatic Smith and Wesson Bodyguard .380 pistol that had been stolen from Michael Bartle’s room, the criminal complaint stated. Haag was treated over the weekend at Thomas Jefferson Hospital and charged Monday with stealing the two guns from the family home. He remained held at Bucks County Correctional Facility pending the completion of an investigation. Prosecutors said Autumn Bartle was evidently confined to a bathroom in the home during the attack. Blood prints on the outside trim of the bathroom window indicated an attempt to escape, but additional handprints on the window sash suggested someone had closed and locked it. Haag was charged Friday with criminal homicide, aggravated assault, burglary, kidnapping, unlawful restraint of a minor and related offenses. The Bartle family has launched a GoFundMe campaign to help cover the cost of funeral and medical expenses. Donations can be made at the page linked below.